Imagine a world where wonder happens every day. 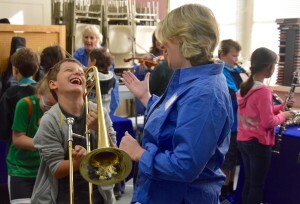 March is “Music in the Schools Month” and the Ojai Music Festival is bringing that to life. 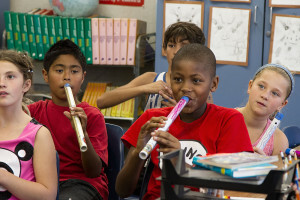 The Festival’s BRAVO Education and Community Program brings the joy of music into classrooms throughout the Ojai Valley and two Ventura area schools with the Imagine Concert, the Music Van, Flutes Across the World, Artists-in-Residence programs, and weekly Education Through Music workshops in every Ojai Unified Elementary school. The children are filled with wonder! When we create music, the brain uses many networks to process phrases, melody, rhythm, and timbre, or tone color. The brain’s auditory areas light up, but so do areas responsible for motor skills, emotions, and creativity. Music employs many sensory systems at once. We are seeing, we are hearing, we are saying, we are doing. Because of this, memory and intelligence improve. Formal musical training improves intellectual skills in several areas. We know from the work of Dr. John Medina, neuroscientist, that music boosts vocabulary, spatial and time awareness, picking out sounds in a noisy environment, working memory, and sensory-motor skills. Music training also helps social cognition. People with music training are better able to detect the emotional information in speech. Empathy skills and other prosocial behaviors improve, such as delayed gratification, regard for other, and perseverance. Cognitive reasoning also improves. Brains of children involved in music have better executive function: strategizing, planning, making connections, interpreting abstract symbols, creating meaning, building community. In producing music, the brain scaffolds thinking on top of feeling in an integrated feedback loop. We practice, try it out, hear it, see other people try it, feel it, and repeat. Brains actually grow bigger! Self-expression helps children and adults feel connected. The arts are self-motivating. We collaborate and cooperate. We must remember to connect to humans. Technology brings many benefits, but can also lead to isolation and distraction. Music counteracts that. We know that the arts lead to deeper social and emotional development. The BRAVO program impacts 1,445 children. 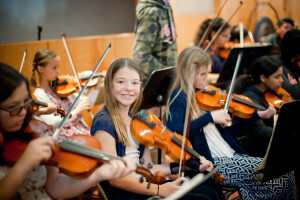 It provides 475 workshops yearly, and introduces over 900 children to the experience of playing an instrument. Many thanks to the Ojai Festivals Women’s Committee and the many volunteers that support the BRAVO program. Through music we learn that there is something that connects us all, that we can be a part of something larger than ourselves.